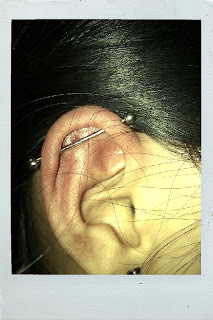 After getting a cartilage piercing with a gun, my noobish, cheap decision was filled with regrets as I knew I would get that scar and that in the end, nothing amounts to a needle piercing. And if I'm going to spend the money why not get it from a pro from a true blue place, not some shady piece of sh*t from St. Marks. Plus I looked through all the reviews on yelp seeing if I could find one on an industrial and sadly I did not. However I went in there today, hoped for the best, got my industrial and.. COLBY IS THE F***ING MAN! My industrial hurt like crazy for the second piercing, which is to be expected, but it was doable and wasn't as bad as it could have been. He's really nice, CLEAN (answers all your questions, let's your friends hold your hand) and won't even give you one of those snobbish kind of attitudes. And when I told him about my retarded cartilage (gunned) piercing he didn't say anything about it and just told me how it would get in the way of my industrial so I took it off. Also you can't beat the price at 20 dollars per hole pierced. It is the jewelry that's more expensive though so it evens out compared to other places (but that's only for basic jewelry). Total with tax my industrial was 76 (plain barbell), not bad at all since I know some other places charge 80-90. Go to him. You'll love him forever! Deft coming back for getting my tragus and rook, probably won't hurt as much since it's just a one-time piercing, not two.